That means putting time and energy into developing yourself, the skills you need and the type of life you desire. Make yourself a priority. Put yourself at the center of your life. This Sunday March 8 is International Women’s Day, and the theme is Make it Happen. I know firsthand that when you’re busy, letting what you want or need easily falls to the bottom of the priority list – it just seems to make the most sense. After all, with family, work, commitments, relationships, school and more, HOW could you possibly make yourself a priority? But I am convinced that investing time in yourself, what you want and need, is crucial to everyone and everything in your life. Investing in yourself positively effects the well-being of your family, work, commitments, relationships, etc. Investing in yourself will truly be the best gift you can give to everyone else in your life. And you can make it happen! Investing in yourself will truly be the best gift you can give to everyone else in your life. Think about it – when you’ve spend an hour doing something important to you, you feel energized, happy, possibly refreshed. You have more to give to others. “Meisa Batayneh is the founder, sole owner, and principal architect at Maisam Architects and Engineers in Amman, Jordan. She shared how she thinks of her life not as “homecentric” or “workcentric,” but “me-centric.” She thinks about her goals and what she wants to accomplish at work and with her family. She explained that she holds fast to and fights for what she wants and needs at work. On the home front, the stakes are even higher. On the other side of the world, I had a similar conversation with Flavia De Hora, a managing director at Accenture in Brazil and the firm’s most senior woman in the country. I spoke with Flavia in one of Accenture’s large, open meeting rooms with huge glass windows and a breathtaking view of Rio de Janeiro. The room was buzzing with several groups of consultants having their own meetings. Flavia had a calming presence. She was soft- spoken and exhibited powerful, yet quiet boldness and authority. Before you get the wrong impression that Flavia is selfish, let me assure you that she is one of the warmest, most caring people you’d ever want to meet. She is an involved mother, a devoted wife, and at work thinks first about serving her clients and second about mentoring and developing women. I want to challenge to you to make strides in investing in yourself in 2015. Make it happen, make this THE YEAR OF YOU. You can start small – take a professional development course, seek a mentor or sponsor make time for exercise, set a regular social engagement with a good friend – whatever it is, I promise you won’t regret it! 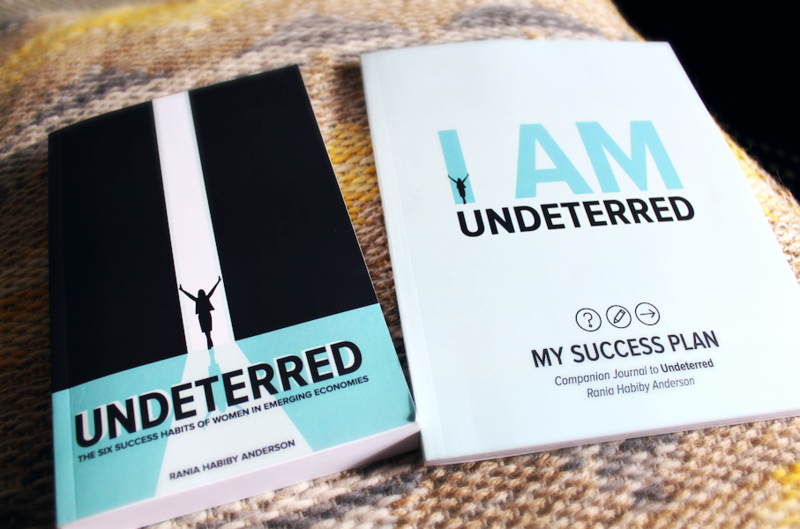 If you aren’t sure what your first step could be, learn more from 250 inspiring women, like Meisa and Flavia, in UNDETERRED, and invest in yourself through its companion workbook, I AM Undeterred. I am here to support and guide you on your path to success! The undeterred women I feature in the book, and the exercises in the workbook, will inspire and encourage you, no matter where you are. Don’t wait! Invest in yourself. Make it happen, make 2015 THE YEAR OF YOU!